My cat killed a Mockingbird the other day. My tiny, affectionate feline killed that bird deader than dead, and then she left the corpse, untouched in any other way, on my patio. The obvious message would be very clear, at least if you were a bird. It was quite succinct and elegant. Do not trifle with me, my cat instructed. I was a little sad to find a dead Mockingbird on the patio, because it made me think of that quote from the book, about what a sin it was to kill such a bird. However, I knew something that the rest of the animal kingdom did not. The bird had it coming. Mockingbirds do make very beautiful music, and it is indeed lovely to listen to them on a spring morning while a person works in the garden or sits on the patio, cogitating. 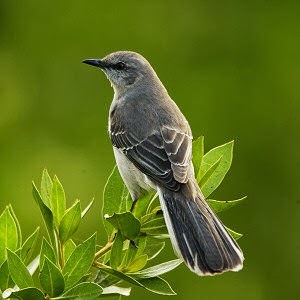 The Mockingbird is the state bird of Texas for one reason: people love them. I have enjoyed many hours of watching the Mockingbirds around me. They are very intelligent, crafty creatures. They're also kind of jerks. For the past thirteen years, my poor cats have been hollered at, pecked at, and dive-bombed. When any of the cats would try to sun themselves on the patio, they never got a moment's peace. Even the feral cat Lalo, who is now on three legs and appears to be blind in one eye, gets his share of the fun. The Mockingbirds are not engaging in this behavior because it is nesting season. That would be completely understandable. The Mockingbirds do this sort of thing to the cats year round. It never stops. I finally had to face the very real possibility that Mockingbirds just liked messing with cats. They're thrill seekers, playing a game of chicken with a predator. None of my other cats ever fought back against the attacks of the Mockingbirds. They were just doing their own thing, after all, minding their business. They put up with the random pecks to the head and tail, the sudden dive of feathers, and the noise, while I ran out with a broom to rescue them. Zena is a different kind of cat. She is tiny, barely 8lbs, but she is fierce. Lord, she is fierce. I've seen her go after raccoons without even a thought. Zena studies everything. She sits in the window and watches. When she gets to go outside, she jumps on top of our barbecue grill, or perches on top of the fence...and waits, her tail twitching, her ears back. It is so easy to underestimate small things. We are unthreatening. Easily dismissed. Overlooked. Small things can be very capable, however. And sometimes dangerous. I am sure that the Mockingbirds thought they were safe. After all, not one of my other cats was a match for their flying speed, even if they had attempted a counter attack. Zena likely waited for them to feel that air of superiority, and then she launched herself into the air, claws out and jaws ready. The Mockingbird probably had no idea what hit them. Ha! Your Zena does sound fierce. I may need to borrow her if my house ever gets attacked by cardinals like it did two years ago. It was the strangest thing. I really thought they were trying to get into my house to peck my eyes out. I will have some barn swallows in a couple of months that could benefit from Zena's ways...Fozzie is completely unproductive! I don't think I've ever seen or even heard a mockingbird. I just know them from the novella and the song. Carly Simon's version especially. At first I thought you were talking mockingJAY, and that's a totally different situation. You are lucky. My cat would make a kill, bird, rabbit, or rodent; bring it in the house; dissect it; place the entrails in a neat pile on the floor, and eat everything else except, sometimes, the head. Mockingbirds sound like 5 radio stations all coming out of one mouth simultaneously. They are miserable to live around in the spring, and I don't blame Zena at all! What a great story, though! Ha !! Our blue jays around here dive bomb cats too! Gotta give them credit picking on animals larger than themselves . Good for Zena because mockingbirds are a-holes. I mean, really, who steals other birds' songs and sings them incessantly, decides to go chastise a hawk, and then finishes the day by terrorizing some cat? Who does that?! I should hire your cat to teach a workshop to the cats in my neighborhood, so they can all develop a strategy to deter (in one way or another...) mockingbirds from from coming 'round here. Ugh...I really hate those birds.